Hayes Motor Co of Lubbock, TX proudly introduces the all new Ram 1500to the community of Lubbock, TX. The fact that the Ram is a good truck in a sea of good trucks is great news for you. It’s nearly impossible to buy a bad full-size truck, and the truck you buy simply comes down to your preferences. If you want a near-luxury-car experience in a truck that’s comfortable enough for commutes and long road trips, even with an empty bed, or if you're looking for an inexpensive basic work truck, the Ram should be your top choice. Many automotive experts consider the 2016 Ram 1500 Quad Cab to be the best all-around performer in its class. Although the base model is a tempting bargain, the feature-filled Limited trim brings, even more, extravagance to the table. Meanwhile, an optional High Fuel Economy package maximizes the truck’s class-leading efficiency. Every driver will adore the Ram 1500’s smooth ride. Buyers can’t go wrong by choosing the standard V-6 engine. The 3.6-liter Pentastar engine has proven itself to be a dependable performer. Not only does the V-6 engine develop a pleasing 305 horsepower, but it can also return good gas mileage. The truck’s highway fuel economy rating stands at a superb 25 mpg. Drivers can take a road trip without breaking the bank. The Hemi V-8 engine continues to excite truck buyers. With a total output of nearly 400 horsepower and 410 pound-feet of torque, the Hemi engine never seems to lose it fun factor. Drivers will also be rewarded with extra pulling power. With a Hemi engine under the hood, the 2016 Ram 1500 Quad Cab can tow more than 10,600 pounds. Numerous accolades have been given to the EcoDiesel engine. The turbocharged diesel engine can deliver a muscular performance without sacrificing any efficiency. While the EcoDiesel engine’s 9210-pound towing capacity is impressive, it also deserves to be recognized for its outstanding fuel economy. Drivers can easily average a sensational 28 mpg on the freeway. Everyone seems to have positive remarks for Chrysler’s Uconnect infotainment system. The 8.4-inch touch-screen display is never slow to respond. Users will appreciate the unit’s large icons. The 3-D terrain maps also will come in handy when taking a trip. Whether the driver wants to check the latest sports scores or glance at the updated weather forecast, the UConnect system can do it all. Plenty of people have raved about the Ram 1500’s nice interior. All of the controls are easy to use, which allows the driver to avoid an unnecessary headache. Unlike some of the competition, the Ram 1500 features a rotary-style shifter that is mounted near the center stack. Drivers will also have plenty of places to store their stuff. 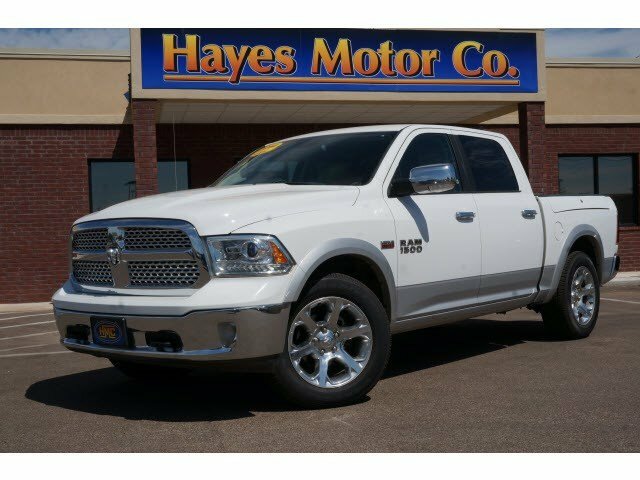 Stop by Hayes Motor Co of Lubbock, TX today and come check out the all new Ram 1500 and take it for a test drive today!